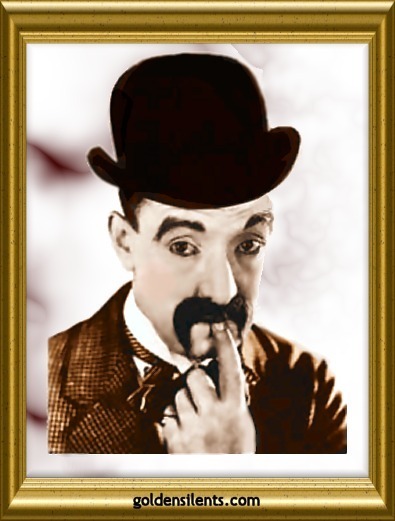 A pale, serious countenance, and a dark, droopy mustache characterized silent film comedian Harry "Snub" Pollard. Born Harold Fraser in Melbourne, Australia, on November 9th, 1889, he joined a vaudeville troupe which toured the United States circa 1910. The troupe broke up and Harry decided to stay, calling himself "Snub Pollard" as a stage name. He began his film career at Essanay in 1911, and briefly worked with Mack Sennett and his Keystone Kops and with Charlie Chaplin. Snub's sister was comedy film actress Daphne Pollard, who also came to America to make comedy film shorts. Hal Roach took an interest in Snub and in 1915 had him co-starring with stars Harold Lloyd and Bebe Daniels in Harold's successful "Lonesome Luke" series. In 1919 Snub tried his hand at his own solo comedy career, making one and two-reelers. Many of these films co-starred a pretty ingenue actress named Marie Mosquini who played Snub's love interest, and were directed successfully by Charley Chase. Snub also continued to make comedy appearances in the theater as his time permitted. In 1926 his own film production company closed, and he was back supporting other top comedians again, most notably Laurel & Hardy and Andy Clyde. Snub had no problems appearing in sound films. During the 1930's and 1940's he played many small character roles in talking pictures, one highlight being his performance as "Pee Wee", second banana to cowboy star Tex Ritter in a series of westerns. Snub continued appearing in films until his death on January 19th, 1962 from cancer.